Every day more people are discovering their own backyards and the fun and beauty they can find there. As folks decide that the time to sell their home isn't now, they are instead looking for design ideas to help them take advantage of what they already have. One of the best home improvements you can make is to enhance the outdoor living areas around your own home. Enjoy the great outdoors without leaving home! Often, the cost of those improvements can be offset or even overcome by the enhanced resale value. The secret to a beautiful and functional backyard design is planning. Don't just start putting the pieces in place randomly. Decide what you want. Think long term. Most of the time folks don't do everything at once - and that can be part of the fun. It's fine and normal to do a little at a time. But you still need to add those pieces with the overall design in mind. You don't want to have to tear down one part in order to add the next part. The most important time you spend will be the time spent thinking and researching - before you actually start implementing the design. We have ideas that will fit nearly any budget. 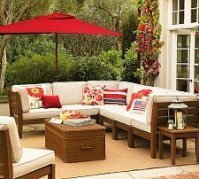 Sometimes just a new piece of patio furniture can make a big difference. Outdoor lighting and a patio heater can completely change the look and the functionality of your outdoor space. Budget minded homeowners are often surprised at the money they save with "do it yourself" projects. We can help with those, too. 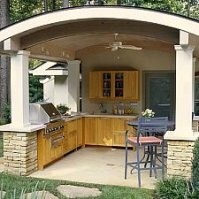 Outdoor living enters a whole new realm with an outdoor kitchen. Whether a fun dinner with the family or a larger gathering for outdoor entertaining, cooking outside is always great. Now it can be as easy as cooking inside - and a lot more fun! A new gazebo offers the perfect gathering place for friends and family. 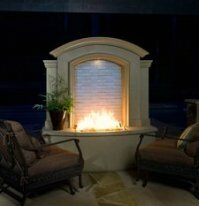 An outdoor fireplace is an increasingly popular way to keep your extra living space useful throughout the year. Decks and patios are the most versatile outdoor areas of all. They are durable multi-purpose areas where all kinds of outdoor activities take place. With a simple patio umbrella and a gas grill, you're ready for the good times. Charcoal grills are rapidly gaining in popularity as well. Does your existing deck need to be re-surfaced? If so, that's the ideal time to enlarge it or add another level. Water features are a great way to make a dramatic impact on the look and feel of your outdoor living area. A fountain or even a soothing waterfall can help eliminate the stress of the day just by walking out the back door. And there's always the hot tub for the ultimate in relaxation. So whether your looking for a three level deck with a complete outdoor kitchen, or a trellis, arbor, or pergola for just that right touch...you're at the right place. Let us help you as you design the perfect backyard living space that fits the needs of you and your family.